Since 2013, New Creation has offered local weekly classes for children in Central AR. This season, classes are offered at three locations: Little Rock, NLR-Sherwood, and Maumelle! What? In weekly classes, we provide a loving and encouraging environment for dancers, as well as technical training in ballet, jazz, tap, hip hop, and contemporary dance. Students also learn how to use their dancing to worship God in class and performance. 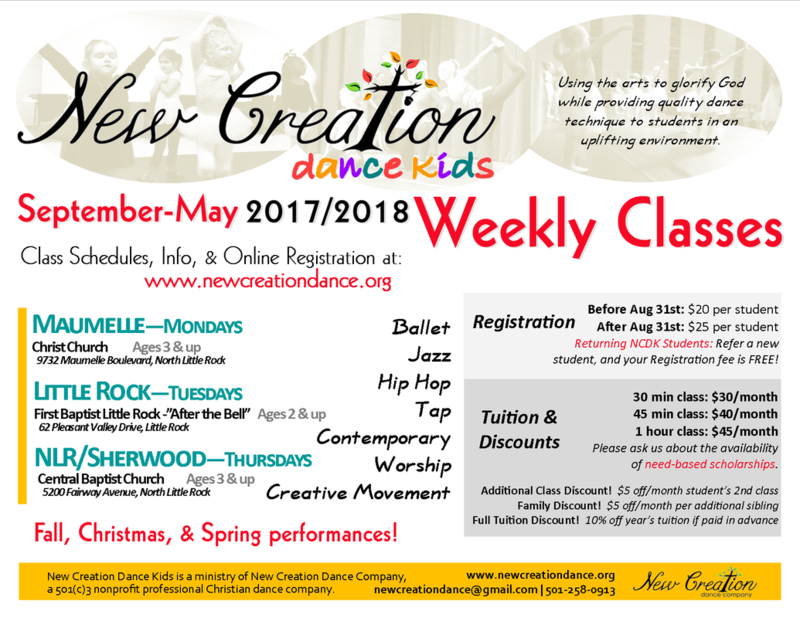 New Creation Dance Kids are split by their age/level, and classes are offered for ages 2 & up. Where? Weekly classes meet at multiple locations in Central AR from September - May. Students perform locally for our Christmas and Spring shows, and also do outreach performances at venues such as nursing facilities and Arkansas Children’s Hospital. Maumelle, Little Rock, and NLR/Sherwood Registration is now closed. Please contact us if interested in registering for classes starting in the Fall!